Long Exhalation with light pressure, from the care giver, on both shoulders, while flexing the trunk forward. Mary, could not maintain a standing position for more than one minute or take a single step due to injury to her body. Although one might assume that she couldn’t walk because of muscle weakness, the condition resulted from her fear of walking, which translated into shortness of breath. Breathing is essential for life. Therefore, difficulty in breathing often leads to fear, decreased ambulation, and limited participation in activities of daily living. How can these patients be helped? Medical professionals who fully understand the physiol­ogy of respiration can teach patients proper breathing techniques to help them maintain their daily routines. Patients like Mary often feel that they are choking and unable to inhale adequate amounts of air: Why? When lungs are not completely cleared of carbon dioxide, they do not have the capacity to expand and inhale oxygen. Panic attacks stimulate the nervous system and cause spasms in smooth bronchiolar muscles thereby obstructing breathing. Other patients experience dyspnea from secretions pooled in the lungs. 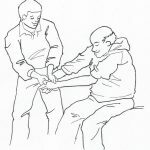 Care giver can help to alleviate symptoms of dyspnea in people of all ages: help children in a state of tension, teach patients with chronic respiratory diseases how to live within the limitations of their physical status, provide respiratory support in medical crises, and assist clients to adopt their lifestyles to a specific level of wellness. A physical therapist can establish a breathing program for patients such as long exhale (breathing out) versus short inhale (breathing in) ratio 2:1. Long exhalations empties the lungs of carbon dioxide and makes space available for oxygenated air. Drink water before going to sleep so mucous on bronchiole walls does not become dry. Self-postural drainage can keep secretions from pooling. Lay 10 minutes on your right side, 10 minutes on the left side, and 10 minutes on your stomach while still in bed. 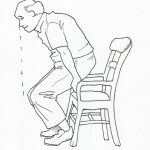 By moving directly into an upright position, secretions settle and become difficult to expel. Keep your trunk flexible by performing rotation, side flexion, and extension exercises. Good posture with mobility in the joints enables the movement necessary for breathing. Practice long exhalation throughout the day. A child may play with a cotton ball by blowing on it; a student may blow into a crumpled lunch bag’ a patient may exhale while transferring from the bed to a standing position or performing any difficult task. Maintain good posture for proper use of an inhaler. Breathe in and out three times to clear lungs. Read directions and expand your chest when breathing in the meditation. Establish a 2-1 breathing program, exhaling to the count of six and inhaling to the count of’ three. This exercise will clear the lungs and create a psychological diversion. A good way to practice is to walk up six stairs while breathing out and three more stairs while breathing in. Incorporate breathing with every day activities. When lifting the knee up, breathe out, so the compressed air will go out from the body when the trunk is flexed. Breathe in when the trunk is being stretched and elongated, so the expansion of the lungs will leave room for oxygenated air. Remind the patient to breathe out with pursed lips. 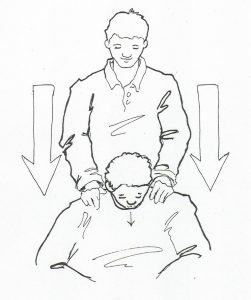 Massage the upper back starting in the muscles between the spine and scapula and work your hands up to the upper trapezius. Apply pressure when the patient exhales and lighten pressure when the patient inhales. 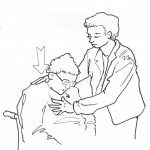 Put light pressure on the sternum and upper thoracic spine during exhalation, to remind patients in a state of panic how to breath correctly. These techniques give patients a tool to use when breathing is stressed. Patients can also evaluate their own progress as they recognize an increased ability to breath without difficulty. As patients develop confidence, the mind and body work together to overcome episodes of labored breathing. 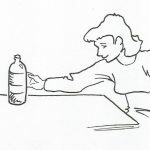 Although patients with respiratory diseases benefit from this learning, other individuals can also use correct breathing techniques. Runners, swimmers, extremely active children, athletic teenagers, and others may achieve greater results when they use long exhalation during periods of physical stress. As patients develop confidence, the mind and body work together to overcome episodes of labored breathing.